Earlier today I had a walk on the beach, running in the sand and chasing the ocean waves for a bit. Now I’m sitting here, slathered in aloe vera gel, because the day was largely overcast, so I underestimated the necessity of sunscreen. It did get me thinking about the Aloe vera plant, though. The pointy succulent has been used in herbal medicine for centuries. It is so widely cultivated today that its natural range is a bit of a mystery, although it seems to hail from northern Africa. Thanks to its soothing reputation, aloe vera features prominently in a wide range of cosmetics. The most commonly used part of the plant is the gel found inside the fleshy leaves, however the sap or latex has its use, too – when ingested, it acts as a laxative. 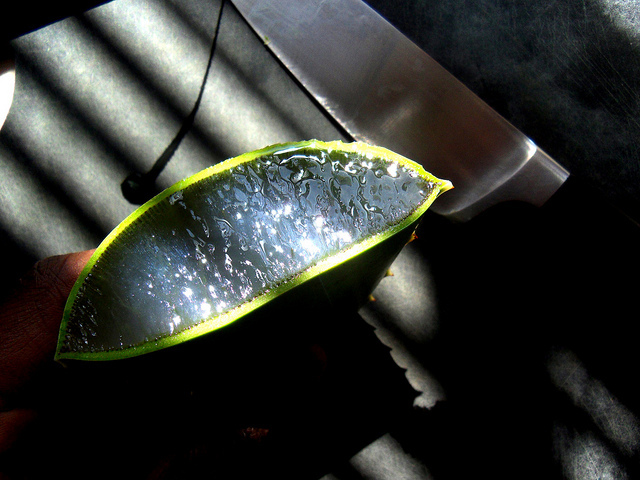 The scientific literature on aloe vera gel is not that comprehensive – most studies that look at using the gel for sunburn seem to be small-scale, and yield contradictory results. Even meta-analyses of many studies help relatively little, because of the small number of controlled clinical trials that can help tease the anecdote and the evidence apart. In short, there is not enough evidence to say aloe vera heals burns, but the results found so far have been promising, with many studies showing an effect to some extent. Aloe vera gel is composed mostly of water,1 however the rest of it is made up from as many as 75 potentially active compounds that range from vitamins to enzymes to various types of acids and sugars. Because it is so difficult to isolate one active ingredient from this cocktail, it’s not even clear what exactly might be responsible for the soothing effect attributed to aloe vera. However, according to a profile from the World Health Organization, “both thermal and radiation burns healed faster with less necrosis when treated with” aloe vera gel. There is a caveat – fresh stuff straight from the leaves seems to work best, because the gel is difficult to preserve, and the chemical composition of it changes after keeping it in storage for a while. Which means that because I just used the bottled stuff, my ‘effect’ may end up to be largely placebo. Next time I stay too long in the sun I should just tear a leaf off the plant in my backyard.